The statue of Augustus of Prima Porta is one of the most well-known statues of the Roman age. The richly decorated cuirass is meaningful, as it emphasizes the peaceful manner in which Augustus managed to reclaim the Roman standards from the Parthians. It also accentuates the divine ancestry of his family, as the Julian family is believed to be descendant from Aeneas, the son of Venus. Augustus wanted to be seen as a restorer of the Roman Republic instead of a dictator, which is why there are surprisingly few references to war in the statue. Most of the references on the statue are to peace or Roman and Greek mythology. However, the statue also emphasizes that the peace installed by Augustus was the result of military victories. In 63 BCE, Augustus was born as Gaius Octavius, as the son of Gaius Octavius and Atia Balba Caesonia, a niece of Julius Caesar . Augustus transformed Rome gradually after he had come to power. He did not want to be seen as a dictator or a king since the assassination of of Julius Caesar, who had presented himself as a dictator, was still fresh on everyone's mind. Augustus reinforced Roman moral values, since the morality of the Roman people had deteriorated badly in his opinion. He also transferred the res publica to the power of arbitrium (discernment) of the Roman senate and people. In doing so, he showed that he was not a dictator, because he shared his power over the res publica with the senate and people of Rome. Although Augustus continued the political tradition as the Roman republic, he was also working on the extension of his own power and authority. Therefore, he tried to present himself as a normal man, so the people would not see him as a dictator. The Roman populace had an aversion to absolute rulers, so Augustus had to be artful and deceitful in order to become the most influential person in Rome without being considered a dictator. He succeeded in doing so: Augustus was begged twice to take on the role of an autocratic political leader, a question to which he answered by tearing his toga apart and to which he replied that he did not want to undergo the same fate as Julius Caesar. Even after Augustus became emperor, his Roman empire could be characterised as a diarchy, since it adopted and united both republican and monarchic elements. This political system resulted in a state of equal balance between republican and monarchical forces, the Roman senate and Augustus, a system which secured the power of the Roman emperor. Augustus also contributed to the restoration of religion by restoring 82 temples dedicated to the gods in Rome. During his reign, he also managed to fill the position of the priest of Jupiter, the flamen Dialis, which had been vacant for 76 years. Even though Augustus combined the most important political and religious functions, he still wasn't seen as a dictator by the Roman population: propaganda played an important role in the influence exercised on the Romans by their emperor. Perhaps the most widely known example of Augustan propaganda is the Ara Pacis or the Altar of Peace. The altar was commissioned by the Senate after Augustus returned from Gaul and Spain in 13 BCE as mentioned in the Res Gestae. "I brought back into use many exemplary practices of our ancestors which were disappearing in our time, and in many ways I myself transmitted exemplary practices to posterity for their imitation. 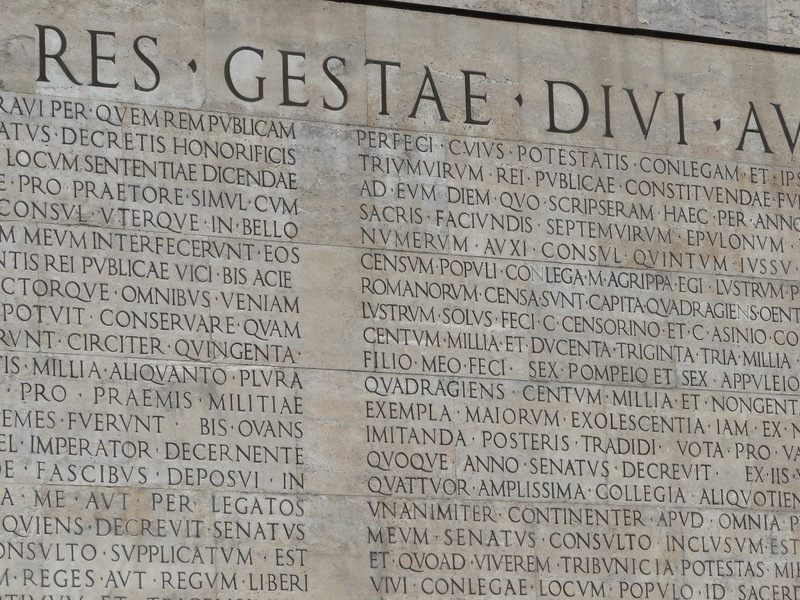 "(Res Gestae 8.5). In doing so, he attempted to convince the people that he was not a dictator or a despot, but merely the restorer of the Republic. This was the cornerstone of most of the propaganda that was used during his reign. The statues that were made of the Augustus played an important role in this propaganda programme. of Primaporta, copy of an Augustan original of 20 B.C. Rome, Vatican Museums, Braccio Nuovo. It was usual for Roman magistrates to commission statues that depicted their power. This Roman art tradition started in the late Roman republic but it was to a considerable extent based on the earlier Greek and Etruscan art prototypes. The portraiture of women was not very common at the time, so unlike some exemptions of goddesses such as Venus, sculptures were mostly made of men. Besides sculptures of marble and bronze, coins with the portrait of the ruler on it were a contribution to the Roman art tradition of portraying the rulers of the late Roman Republic and the first emperors of the Roman Empire Late Republican statues often depicted rich men who were successful in Roman society, due to their military and daily life experiences. However, Augustus acted differently. He broke with the typical Republican image of men and especially in the early days of his reign, he wanted to be depicted as a young and ordinary man, so people could identify with him. A great example of that wish is the bust of a younger Octavian that dates from 30 BCE. Augustus was only nineteen years old, when he already had considerable influence in Roman politics. Therefore, he is portrayed as a vital and young man, which is the complete opposite of the late Republican idealization of the most important man of Roman society. Not a single part of the statue indicates the fact that this youthful Octavian became a powerful emperor of Rome, but while his power grew, the nature of his statues also changed over the years. After 30 BCE, his statues adapted more of a military stance instead of the civilian approach of his first statues. This could, for example, be seen in an equestrian statue of Augustus dated at the end of the first century BCE. At first sight the artist who made the statue worked along the same lines as the older statues. However, Augustus is depicted on the horse wearing a seal ring which was only worn by the emperor of the Roman empire. Therefore, the small details of this statue already gives us an insight in the ideas behind the sculpture: Augustus was no longer only depicted as just an ordinary citizen of Rome but also as the princeps of Rome, the most influential citizen of the newly established empire. The statue of Augustus of Prima Porta probably dates from 20 BCE and the statue as we have it is a copy of a bronze statue. It was the first statue that depicts Augustus in all his glory by portraying him in military armour. Moreover, this specific sculpture emphasizes his divine descent. Augustus is thus no longer only represented as an emperor in a very subtle way, such as the seal ring on the equestrian statue. 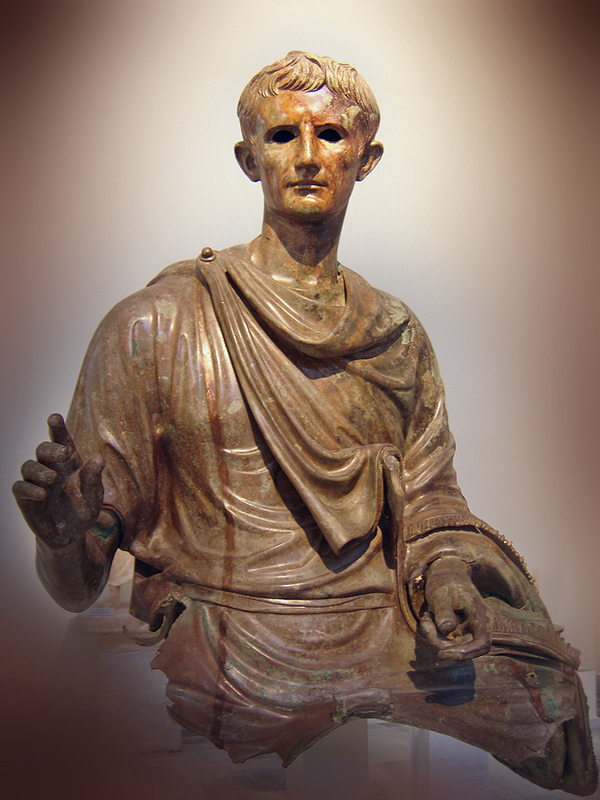 The Prima Porta statue contains several clear indications that Augustus is the ruler of the Roman empire. Augustus could still be recognized in this portrait, but this image of Augustus is more idealized compared to the other two statues, portraits do no longer contain a realistic likeness . The statue of Augustus Prima Porta portrays Augustus wearing military clothing with a richly decorated cuirass. He used to carry a spear in his left hand and possibly he used to hold returned military standards in his right hand. The statue was found in Livia's villa near Prima Porta, hence its name. It is probably the marble replication of an earlier-made bronze statue that has been made around 20 BCE, in the years following the defeat of the Parthians. [10,11] Augustus forced the Parthians to restore the Roman standards, taken by the Parthians in 53 BCE through diplomatic means in 20 BCE. Because Augustus had taken possession of Armenia, the neighboring country of the Parthians, they feared defeat if it would come to a battle. This can be concluded from the motifs on the cuirass, which refer to Horace's Carmen saeculare according to some sources, as his poem contains both the gods depicted on the cuirass as the situation with the Parthians. Thus, the commissioner of the statue is likely to have been close to Augustus. The whole body of the depicted Augustus resembles earlier statues made by the sculptor Polykleitos, in which the depicted persons used to be idealized. The statue shares features with two other statues: the Doryphoros by Polykleitos and Lysippos of Sicyon, both of Greek origin. The Doryphoros is believed to depict Achilles and the Lysippos is most likely a statue of Alexander the Great. One of the biggest differences is that both statues had their spears pointed upwards, while the spear of the Augustus of Prima Porta statue points down as a sign of peace. This conveys the image that Augustus surpassed both Alexander the Great and Achilles, for he had succeeded in the surrender of the Parthians without using violence. However, what distinguishes the Augustus of Prima Porta most from those previous statues, is the detailed, decorated cuirass. It was the first statue that depicts Augustus in all his glory by portraying him in military armor. Previous statues showed his position as emperor in a more subtle way. The equestrian statue for example only indicated his position with the emperor’s seal ring. In the middle of the cuirass one can see a Parthian King in a toga holding the Roman standards with the legionary eagle of Jupiter. The king acknowledges the Roman greatness by looking at the eagle of Jupiter. He returns the Standards to a man, whose identity is unsure. Some argue that it is Tiberius, Augustus' successor. Others argue that this man is the god Mars Ultor. [10,11,14] Next to the Roman is a she-wolf, the Roman Lupa�, so whether this person is Mars or Tiberius, we can be sure that the man is Roman. If the man is Tiberius, he is portrayed in a very honourable manner, so trust in the successive emperor would be shown. However, he is still insignificant compared to Augustus, on whose statue he is depicted. One argument for assuming that this would be Mars instead of Tiberius, is that the statue stood most likely in the Temple of Mars Ultor, built on the Forum of Augustus. Above these two men, several divine figures can be distinguished. On top of the middle of the cuirass, is Caelus, or Saturnus. He can traverse the sky happily now because of the peace that Augustus brought in reuniting the West and the East of the Roman empire. On his left is Apollo the Sun God and the god of Augustus' Golden Age. Augustus tried to create an special association with Apollo. On his right is his twin sister Diana depicted as Luna or moon goddess. She could be recognized as Luna because she wears the torch that would make her noctiluca or lucifera as also described by Horace in his Carmen. Other sources however argue that this woman is Venus, who was identified with the Morning Star. The goddess is carrying another divine figure that symbolizes dawn, or Aurora. Aurora symbolizes the start of a new day, or to be more abstract, a new age. These astral gods, which rise and fall every day and night, also symbolize eternity. Apollo and Diana are shown again in the left and right bottom of the cuirass, with the typical lyre and stag. Between them, there is the goddess of Earth, Tellus, with the Horn of Plenty and Abundance, again to symbolize the prosperity that Augustus brought. This Mother Earth is also the Tellus depicted on the Ara Pacis, where she also symbolizes the new age	Above the stag and the swan of Apollo and Diana, there are two mourning women visible. The woman on the left is armed with a sword and represents nations that are not subjected to Roman power, such as Armenia and Judea  or the buffer states in the East or Germany. The unarmed woman on the right holds an empty sword sheath, because she represents nations that have already been incorporated into the Roman Empire  such as the Gallic tribes, or the Celtic tribes, which used to have a boar as their symbol, as is also depicted with the woman. She also carries the dragon trumpet or karnyx with her, which is also a characteristic symbo. Despite the contrast between the women, both of them have experienced the Pax Romana in some way, either by being conquered or by being a client state. On his shoulder flaps, two sphinxes have been depicted. These symbolize Augustus' victory over Egypt, a province that provided the Roman Empire with a lot of wealth. Sphinxes are also considered to be guardians of the world. The dolphin on his leg symbolizes other naval victories  and the Cupid14] ] The emperor wears no military boots even though he is wearing his full armour to go to war on the battlefield; since gods are depicted with bare feet, this essential missing detail is an indication that Augustus is god-like. Not only the richly decorated cuirass, but also the pose of the statue is of importance, in particular the right arm. This gesture is called adlocutio, a raised index finger, which is a sign to greet an army. On the battlefield, the army would normally salute back in the same way before a battle started. The Prima Porta statue is not the only sculpture of Augustus with a similar hand gesture.His pose set an example for numerous emperors, kings, dictators and rulers who were in power during the course of history. By striking the same pose as the first emperor of the Roman empire, these powerful men all wanted to copy the successfulness of his reign over the empire. The diplomatic and war victories of Augustus laid the foundation for a long and stable peace, also called Pax Romana. Therefore, the empire created by Augustus was seen as an ideal political situation, which provided the foundation for an aeternitas imperii, an everlasting empire. In his military armour he is represented as a powerful man, and a commander of the Roman legions. The statues of Augustus are examples of imperial portraiture, which had an additional function to the functions of Republican portraiture. Late Republican statues were only used for two functions, the glorification of the most powerful men at the time and the commemoration of those who already died. [9 The statues of Augustus show a new third function, namely to propagate imperial power. 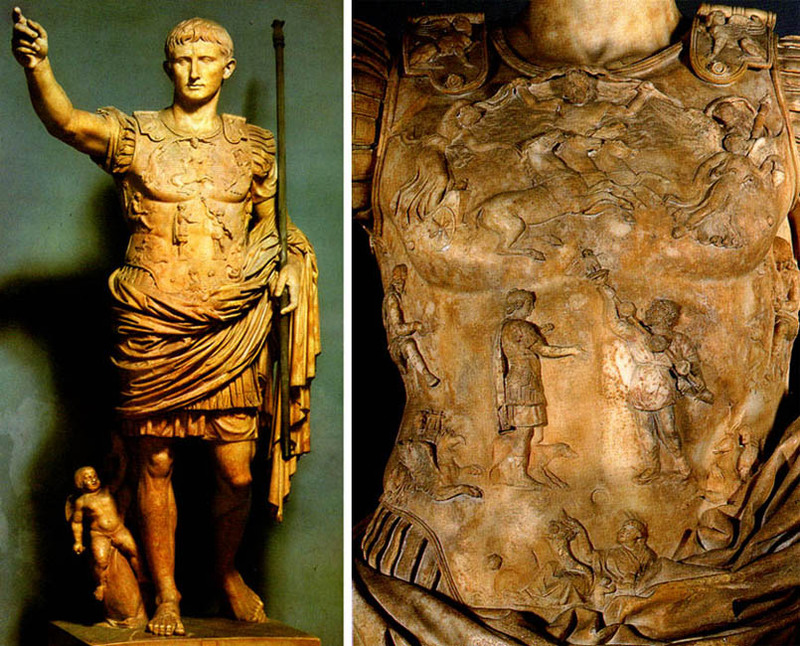 By wearing the image of victory and peace on his cuirass, Augustus seems a representative of the will of the gods. He embodies a connection between the state and the gods. An important aspect of the Prima Porta statue is that it is not only showing a victory by military force and violence, although it depicts several symbols of war, but also a victory achieved by diplomacy. Most of the depicted symbols, symbolize a peaceful victory or Augustus’ divinity. This is important, because Augustus' position depended on his image as "savior” instead of a "conqueror” since he implemented a long period of peace after his diplomatic and military victories. The cuirass is used to promote the returning of the Roman standards as a significant turning point and the start of a peaceful era. It also symbolises Augustus' victory over the barbarians, which made the prosperity and political success of the Roman empire possible. Since Hellenistic times, an emperor's divine powers were measured from his military victories. From now on, a victor was not just the strongest fighter, but the keeper of the peaceful world order, of which the gods approved. This is one of the first statues in Roman times with the function of propaganda. The sculpture could thus be seen as a bridge between Roman sculptures during the reign of the consuls and the age of the emperors. To enforce his power gradually, the sculptures that were made of Augustus changed during his lifetime. Republican values were combined with monarchic characteristics during the first years of the emperors' reign in order to present the accession of the young Octavian to the emperor's title as a logic consequence of the course of history. In short: the statue was the product of a gradual progression of the display of status in the sculptures of Augustus. It shows the peaceful way through which Augustus enlarged his empire and empathises his divine descent. Karl Galinsky. Augustan Culture: an interpretive introduction. Princeton University Press 1996. p. 58-64. Paul Zanker. The Power of Images in the Age of Augustus. University of Michigan Press 1990. p. 172-238. Walther Kolbe (1931). ‘Von der Republik zur Monarchie’. In: Walter Schmitthennen (ed.) (1969). Augustus, Wege der Forschung. Darmstadt: Wissenschaftliche Buchgesellschaft . pp. 72-99. Karl Galinsky. Augustan Culture: an interpretive introduction. Princeton University Press 1996. p. 288-293. Karl Galinsky. Augustan Culture: an interpretive introduction. Princeton University Press 1996. p. 141-152. Diana E.E. Kleiner. Roman Sculpture. New Haven: Yale University Press 1992. Pp. 54-69. Roman Emperors. Augustus. 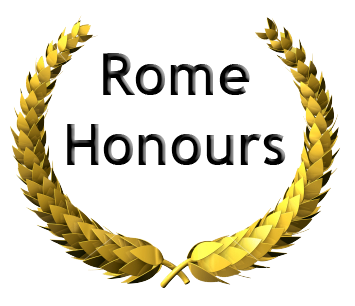 Available through: http://www.romanemperors.com/augustus.htm accessed on 2 October 2014.
accessed on 2 October 2014. Jean-Luc Daval (ed.). La Sculpture: le Prestige de l’Antiquité. Geneva: Éditions d’Art Albert Skira S.A. 1991. Pp. 167-169, 191-195. Paul Zanker. The Power of Images in the Age of Augustus. University of Michigan Press 1990. p. 183-192. Alexander Bätz and Christian Staats (2014). ‘Das Grosse Vorbild’. In: Zeit Geschichte, Roms erster Kaiser Augustus 9(2). Pp. 98-104. M. Hofter et al. (1988). Kaiser Augustus und die Verlorene Republik. Mainz am Rhein: Von Zabern. Pp. 311, 359-362. Marble sculpture of a youthful Octavian, ca. 30 B.C. Rome, Museo Capitolino. Photo: Gisela Fittschen-Badura. Bronze equestrian Augustan statue, last two decades first century B.C. Athens, National Museum. Photo: Deutsches Archäologisches Institut Athen. Portrait as Augustus as emperor of the Roman empire, from the Villa of Livia of Primaporta, copy of an Augustan original of 20 B.C. Rome, Vatican Museums, Braccio Nuovo. Photo: Alinari/Art Resource, New York, 1318.